Kubhera Insulation, established in Chennai, (Tamil Nadu) India, engaged in manufacturing, and Trading a wide range of Rubber Strip, Sealant Backer Rod, Foam Tapes, Foam Die Cut Machine, Adhesive Acrylic Tapes, Self Adhesive Tapes, Foam Sheet, Double Sided Glazing Tapes, Industrial Spacer Tape, Butyl Tapes and much more. We have a wide spacious Infrastructure which is spread in 5000 sq.feet and is divided into various divisions such as manufacturing, warehouse & packaging, quality inspection, supply & export, etc. Our team of production and marketing unit which is promoted and guided by our mentor promoter, Mr. D. Chandersekar who has wide experience of more then 25 years in the same domain and work towards providing complete solution of Foam Tapes & Insulation Material to our esteemed clients at reasonable market cost. We manufacture all the products using high quality material, ensuring excellent adhesion and durability. Quality is our main aim since the inception of our organization as we are leading quality centric organization and provide complete solution of high quality electrical insulations taps and materials. We export these Foam Tapes & Insulation Materials in various parts of the world in customized packaging that meets international packaging standards. We are a renowned quality oriented organization and are dedicated towards offering an excellent quality of Foam Tapes & EPDM Rubber Gaskets. These are manufactured using high quality raw material such as foams, XLPE, adhesive, PU foam, imported liner and paper that is procured from quality-driven organization and that meets international standard. We do complete quality and performance measure inspection of our entire range of Insulating Tapes & Insulation Material before delivering to our valuable clients. Our wide range of products is highly durable and has excellent adhesion and supreme durability. Our complete range of Industrial Masking Tapes, Foam Sheet is available in the market with the brand market name “2 TUF” that are highly appreciated by our esteemed clients throughout the world. These are available in various specifications and we offer these products as per the requirement of clients as to provide complete satisfaction. We are engaged in offering an excellent range of Foam Tapes & Insulation Material that are manufactured using high quality raw material such as foams, XLPE, adhesive, PU foam, imported liner and paper that is procured from quality-driven organization and that meets international standard. 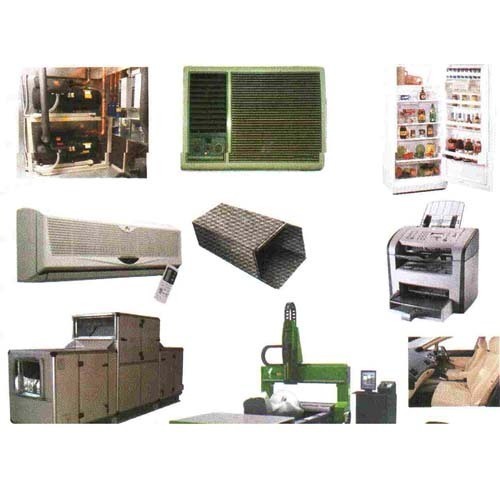 These are widely demanded in several industries such as Automobile, Leather, Refrigeration and Air Conditioning. We are a leading organization engaged in offering a wide range of Insulating Materials. These are used in various industries such as Rubber Strip, Sealant Backer Rod, Foam Tapes, Foam Die Cut Machine, Adhesive Acrylic Tapes, Self Adhesive Tapes, Foam Sheet, Double Sided Glazing Tapes, Industrial Spacer Tape, Butyl Tapes and much more. Goods made of insulating materials for thermal insulators and insulating elements namely insulating materials. We are one of the renowned client-oriented organization as client satisfaction is our prior aim towards which we are dedicated since the inception of our organization. We export these products in various parts of the world at reasonable market prices. We make permanent relationship with our esteemed clients by fulfilling complete range of Foam Tapes &Insulation Material that is widely appreciated for excellent insulation properties and durability. We are one of the renowned manufacturer and supplier of a comprehensive range of Foam Tapes & Insulation Material with the brand market name “2 TUF” that are highly appreciated for excellent quality and supreme adhesion.